Crate training creates a comfortable and relaxing home or "den" for your dog. It can be a safe place for him when you are away, or at night, or when you simply don't want your dog to have unlimited access to your home, for example when visitors arrive. When crate training a new dog, you always want to reinforce the idea that being in their crate is a good thing. In order to train your dog to be accepting of the crate, you never want to use it for punishment. Instead, your dog's crate should be a safe space, giving both you and your pet peace of mind. If you're looking to start crate training your new puppy or even older dog, here are tips on creating a happy place he'll enjoy. 1. Introduce your dog to his crate. Getting your dog acclimated to his new crate is an important step. Start by putting his crate in an area of the home where you spend a lot of time. Fill it with a blanket or soft towel and leave the door to the crate open for your dog to easily walk through. Create a trail of treats leading inside the crate to encourage your dog to follow it. Do not force your dog inside of the crate. Instead, continue to toss small treats inside until your dog walks in on his own accord. (If the food/treats aren't working, try a favorite toy instead.) Once your dog does fully enter the crate all by himself, be sure to give him lots and lots of love to let him know this is good behavior and that the crate is a good place to be. Your dog may not love and understand the crate at first. It's going to take practice and training to get a pup to associate the crate with a safe place to be. Work with your dog multiple times a day by walking them into the crate and giving them lots of love and praise when they enter it. 3. Feed your dog in his crate. Creating positive associations with the crate is another way to enforce it being a safe, happy spot for your dog. If your dog is already happy to enter his crate without issue, place the food bowl all the way at the back of the crate. 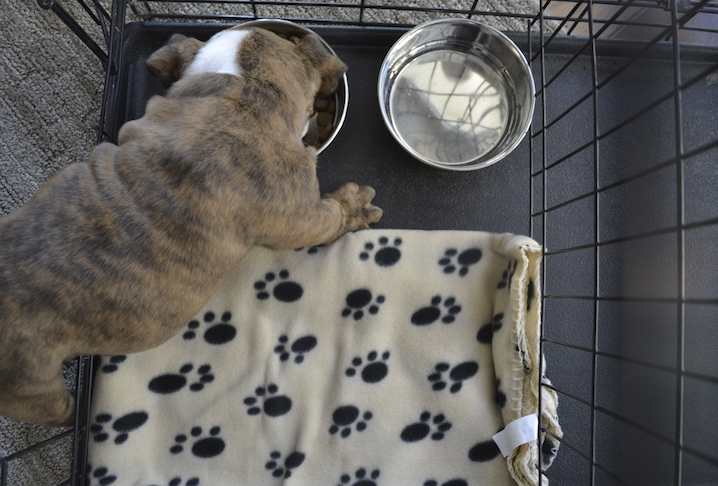 If you're still having troubles and your pup is anxious about his crate, place the food bowl as far into the crate as you can willingly get him to go. 4. Put your dog in his crate for longer periods of time. Start by shutting the crate door during feeding time and beginning to wait 10 minutes after he's done eating to let him out. Then, start putting him in his crate when left alone. If your dog whines to get out, do not let him out until he stops, or he will associate whining with getting out. The goal is to encourage your dog to view the crate as a nice, cozy and safe space. Praise him during training each time he goes inside, and your dog will easily learn that the crate is a good place to be. If your dog loves his crate, it makes leaving him alone that much easier on you and your dog.